Turning your old family photos into digital images is a daunting process. You can choose the hard way and scan each photo individually, then crop and rotate them with tedious work. Alternatively you can install AutoSplitter and scan multiple photos at once, split them automatically, and then save them as individual image files. This lightweight and very simple software greatly enhances photograph scanning. 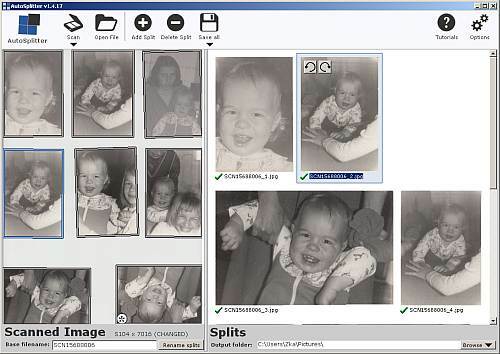 Place your photos on your flatbed scanner's document window, then let AutoSplitter scan, recognize and crop the individual photos automatically. This process would take a lot of time and effort with any popular image editing software. This multiple photo scanner software will do the trick with a single click. Probably most families have lots of old photographs boxed in the cupboard, yellowing and tearing, waiting to be rescued. They are fading out instead of being digitized, saved for eternity. Make sure your grandchildren will see your family photos - AutoSplitter is probably the best way to do so. Photo scanning services cost a lot, total strangers will observe your family photos and even worse: the photo package may get lost or destroyed during shipping. This is not a risk you want to take, don't you? This utility provides better turnaround time than photo scanning services while securing your privacy and the safety of your memories. Saving your memory box has never been easier. Install this Windows application and start scanning your photos. Visit the website, check out the demonstration video and download this multiple photo scanning software. A spinoff of the successful AutoSplitter specialized in stamp scanning. 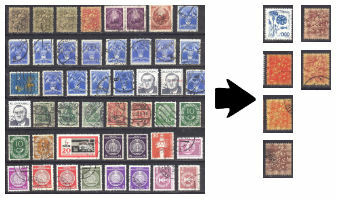 Scan an entire album page and save individual stamps separately.